A few additions to a ready-made curry paste give this Thai-inspired dish a surprising depth of flavour. 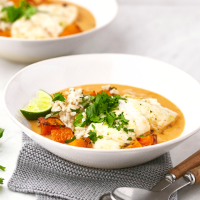 Poaching the fish keeps it delicate, while butternut squash is a source of vitamin A. 1. Preheat the oven to 200˚C, gas mark 6. Arrange the squash on a foil-lined baking tray; drizzle with ½ tbsp oil, season and roast for 20 minutes, until tender. 2. Meanwhile, put the rice in a pan with 250ml water and 50ml coconut milk. Bring to a boil, then simmer, covered, for 20-25 minutes. 3. In a large pan, heat the remaining ½ tbsp oil and fry the onion and ginger for 3-4 minutes, until fragrant. Add the curry paste and cook for 2 minutes, until it begins to colour. Add the fish stock and remaining 150ml coconut milk, then simmer for 10 minutes. Add the fish, cover and simmer gently for 5-6 minutes, until cooked through. 4. Toss the squash through the rice. Divide between shallow bowls, top with the curry and garnish with roughly chopped coriander and lime wedges, if liked.